A bronze medal for Lily Zhang four years ago in the Chinese city of Nanjing; now four years later at the Buenos Aires 2018 Youth Olympic Games, play commencing on Sunday 8th October, the focus for the United States is on the brow of Kanak Jha. He is the no.2 seed in the Men’s Singles event and partners Amy Wang, the Women’s Singles no.9 seed, in the Mixed International Team competition; on both fronts he is a contender for honours. Logically, you participate in the Youth Olympic Games and then progress to the Olympic Games; the fact that he has followed the opposite route sets him apart from all his challengers in Buenos Aires. Moreover, whatever the outcome in Buenos Aires, Kanak Jha is already a record breaker. At the Rio 2016 Olympic Games, he was the youngest American athlete on duty and the first American born since Saturday 1st January 2000, the dawn of the Millennium, to qualify for the prestigious multi-sport event. A notable achievement but the most notable of all was that achieved on Thursday 26th June 2014 when he won the Men’s event at the North America Cup in Burnaby. It was a remarkable on two counts. He was beaten in his very first match of the tournament by compatriot Adam Hugh; before accounting for Canada’s Marko Medjugorac to secure a main draw place. At that stage he blossomed; he beat the United States duo of Timothy Wang and Jimmy Butler, before turning the tables. In the final he overcame Timothy Wang. The second count was that the win came just seven days after his 14th birthday! 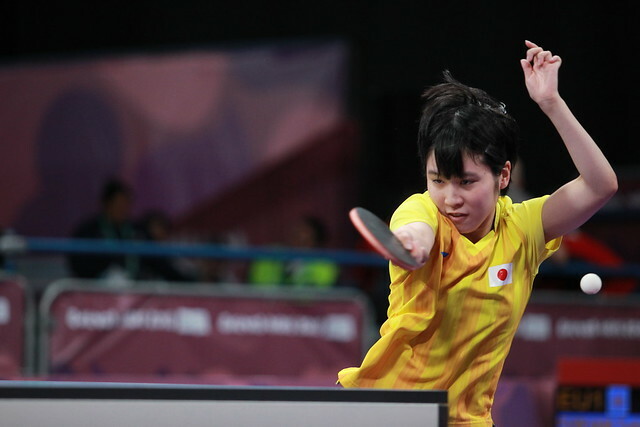 Quite stunning, the result that matched the vast majority of the players who were competing in the ensuing Nanjing Youth Olympic Games which commenced some two months later on Saturday 16th August. The only problem for Kanak Jha, who had duly booked his place in the Liebherr 2014 Men’s World Cup to be staged later in the year in Düsseldorf, was that he was not eligible to compete in Nanjing. You have to be 15 years of age in the year of the Games. Good form on what is now over four years ago, Kanak Jha has also been in good form this year. In late February at the 2018 Team World Cup in London, in the group stage of proceedings, against Hong Kong, he beat Wong Chun Ting, listed at no.7 on the Men’s World Rankings at the time. he won in three straight games (11-8, 12-10, 11-8). Later in the year he finished in third place in the Pan American Cup in Paraguay, before in the Dominican Republic winning the Boys’ Singles event at the 2018 Pan American Junior Championships. The efforts of Kanak Jha rather overshadow those of Amy Wang. Equally she has impressed this year; at the Pan American Junior Championships she was the Girls’ Singles runner up. Both Kanak Jha and Amy Wang qualified for the Buenos Aires 2018 Youth Olympic Games by emerging successful at the North American Qualification tournament staged in December 2017 in Las Vegas.